To continue with the seed-saving series, let’s focus on cucurbits (melons, squash, cucumbers). As with corn, the seed-saving challenge for the home sub/urban gardener will be to maintain a population size that will permit seasonal attrition and genetic diversity. When it comes to cucurbits, the gardener must know the scientific names of the crops she wants to grow. Cucurbits will cross-pollinate within their species (Cucumis melo with other Cucumis melo) but not inter-species, i.e., within the genus. So you can grow ‘Minnesota Midget’ cantaloupe next to your zucchini (Cucurbita pepo), and they’ll be fine. But you cannot grow cantaloupes, honeydew melons, and crenshaws together (all Cucumis melo) without expecting cross-pollination. Common names in this family can be misleading. Armenian cucumbers, for example, are Cucumis melo, but regular salad-type cucumbers are Cucumis sativus. Summer squash, another cucurbit, is Cucurbita pepo, as are pumpkins, but winter squash may be Cucurbita pepo (acorn, crookneck, scallop-type, and spaghetti squash; zucchini; and pumpkins) Cucurbita maxima (hubbard and turban squash, buttercup squash, and some pumpkins), Cucurbita moschata (butternut squash), or Cucurbita argyrosperma. In short, if the Latin name is the same, you can’t grow them together without cross-pollination. If the first half of the name is the same but the second half isn’t (Cucurbita pepo and Cucurbita moschata), you’ll be fine. First, keep cantaloupes and other muskmelons 1600 feet away from other muskmelons (what’s your neighbor growing over his fence?). Cucurbits are insect-pollinated, and given the distressing decline in native pollinator populations, it’s not fair to assume you’ll have a healthy supply of wild pollinators nearby. Without an abundance of natural pollinators, you may have to resort to hand-pollination to get any fruit set. Fortunately, hand-pollinating is quite simple. 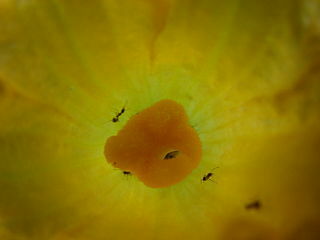 Cucurbits produce male and female flowers on the same plant. Fruit will form from the female flowers if they are pollinated. Female flowers can be distinguished from male flowers by the fruit (the bulbous part, or ovary) at the base of the flower. 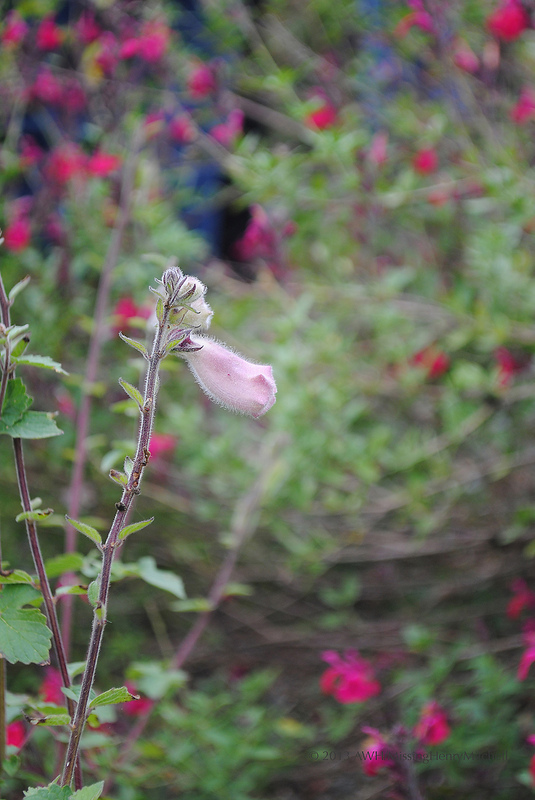 Male flowers do not have an ovary. Male flowers (squash flowers are pictured) have straight stems and no bulbous structure (ovary) at the flower’s base. 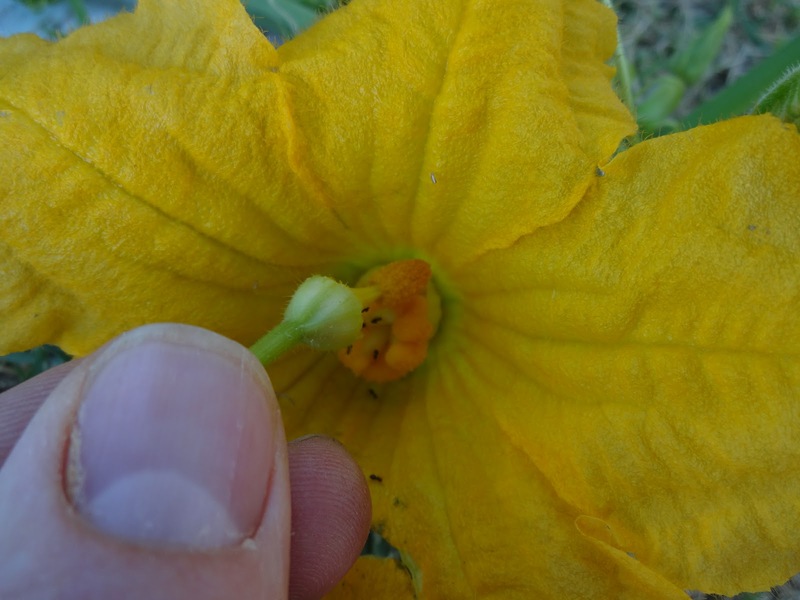 Female flowers (squash flower pictured here) have a bulbous structure, the ovary, between the stem and the flower petals. The ovary will develop into the fruit after pollination. To hand-pollinate your plant, pick a male flower from the plant and peel back its petals, exposing the pollen on the anthers. Find a female flower, and gently open its petals if necessary. Rub the pollen on the stigma, and let the petals fall back to their original position. One male flower can pollinate multiple female flowers. Pollinating the female stigma with the male anther. Photo by Jay at Scientific Gardener under Creative Commons 3.0. The flowers tend to open early in the morning, and close as the heat of the day increases, so plan your pollination activity accordingly. A peculiar habit of cucurbits is that the female flowers often develop later in the season than the male flowers. Day length, light intensity, and temperature all influence the ratio of male to female flowers produced. Long, hot days yield more male flowers; cooler temperatures and shorter days yield more female flowers. Muskmelons are easy. When the melon is ready to eat, the seed is ripe. Separate the seeds from the flesh, rinse them clean, and allow them to dry on a screen away from heat and direct light. Store in a clean glass jar or paper envelope in a cool, dry place. Who doesn’t love corn? But when each plant yields only 2 ears or so, it can be hard for the average home gardener to maintain a reasonable population size to permit good genetic diversity and account for seasonal attrition. 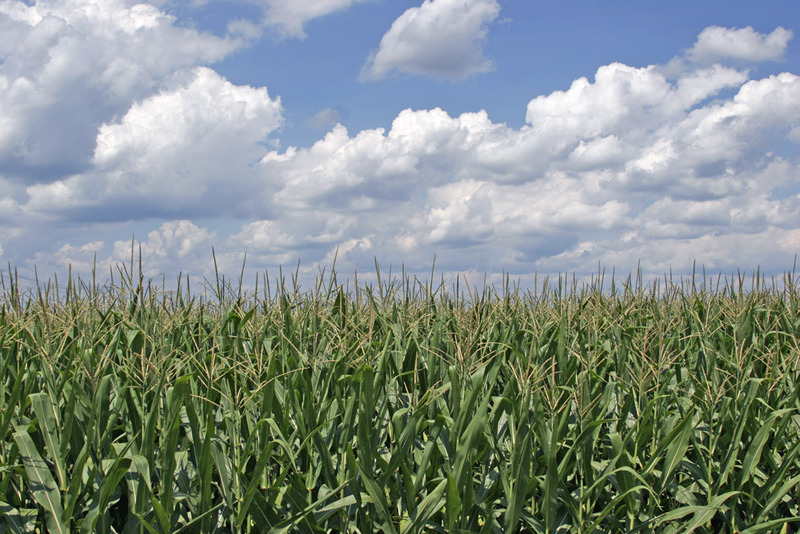 Corn is wind-pollinated, and to prevent cross-pollination for seed-saving purposes you must maintain more than 1/3 mile (some sources say more than ½ mile) between your corn and anyone else’s. If you live in a typical American suburban cul-de-sac development, avoiding contamination might be impossible if anyone else on your block grows corn. If you don’t have 200 plants, you might be able to use row covers to shelter your corn from other varieties. Frames can be made out of flexible PVC piping that are both inexpensive and can support row covers, but this might be more work than you want to do. A short word about GMOs: In 2010, 86% of the corn planted commercially in the US contained some modified genetics. Genetically modified corn seed, such as Monsanto’s Roundup-Ready seed, is not sold to the home gardening market. However, a 2004 pilot study by the Union of Concerned Scientists found that modified genes had found their way into 50% of the non-GMO corn seed they tested. Their test seeds had been purchased from the same retailers that sell to US farmers. The UCS data suggest a 1% contamination rate in the seeds of traditional varieties, which equates to 6250 tons of transgenically-derived seeds planted in fields of traditional crops. In 2004, approximately 81 million acres of corn were planted in the US, and 45% of all corn planted were biotech varieties. In 2013, that amount had grown to 97.4 million acres, of which 90% were biotech varieties. Such statistics suggest that in the past ten years since the UCS pilot study, accidental contamination of non-GMO seed stocks may have also increased, and may have found its way to a corn seed packet near you. And if you live within approximately 1/3 to ½ mile of a farm where corn is grown commercially (particularly for commodity corn, used in the production of ethanol or for livestock feed), the potential for direct GMO cross-pollination with your home-grown crop exists. Hybrids are not the same as genetically modified organisms, but seed saved from hybrid corn will not come true. Open-pollinated corn may cross with nearby hybrid varieties by wind pollination, which may result in unfavorable traits in your second-generation corn seed. 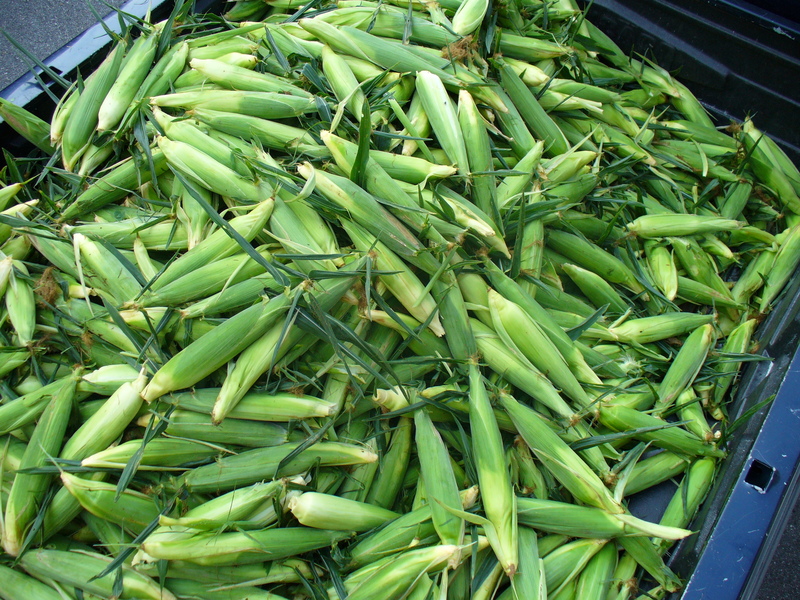 Sweet corn will also cross-pollinate with field corn and ornamental corn, resulting in less-sweet sweet corn. Place bags around the ears of corn before the silks emerge, securing the bags tightly. Separately bag the tassel, which contains the pollen. Shake the pollen from the tassel and allow it to collect in the bag. Then de-bag the ears, shake the pollen onto the silks, and re-bag the ears to prevent cross-pollination. Allow the ears to dry on the plant. For sweet corn, harvest when a fingernail pressed into a kernel releases a milky fluid. Peel back the browned husks and allow the seeds to dry on the cob in a well-ventilated space. Twisting the dried ears will encourage the kernels to fall off the cobs, and you may also rub the kernels off by hand. Store in a glass jar in a refrigerator or other cool, dark place. Further tips on saving corn seed may be found at the Seedsavers.org blog, http://blog.seedsavers.org/preventing-gmo-contamination-in-your-open-pollinated-corn/. 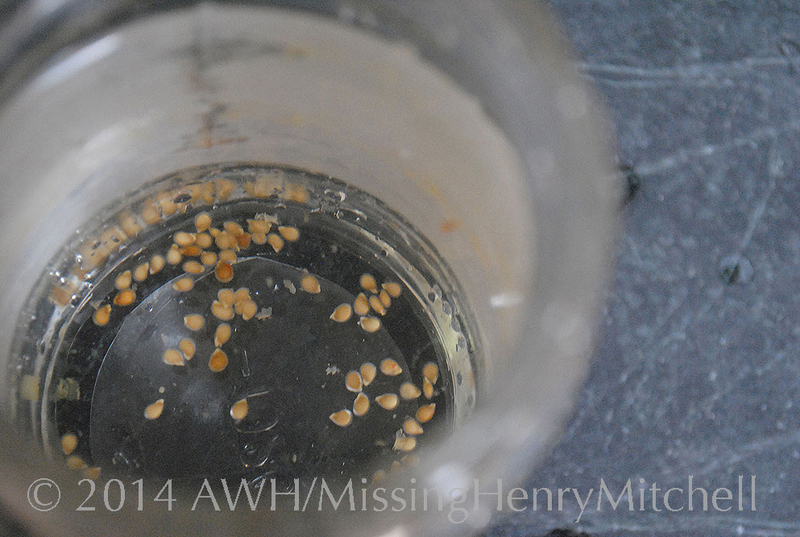 My last real post began to explore isolation distances and their role in seed saving. This is a big and complicated topic. I find that sometimes, the best way to grasp an expansive topic is to try to apply it to a more particular situation. All of these are open-pollinated varieties. Table is adapted from A Seed Saving Guide for Gardeners and Farmers by the Organic Seed Alliance, www.seedalliance.org. The immediate issue visible for most sub/urban home gardeners is that we have nowhere near the space to grow 20 tomato plants and 200 corn plants, so maintaining a population size to ensure good genetic diversity may not be an option. You can still grow enough plants to feed your family, and save your seed and even share it. This, perhaps, is the most reasonable plant of the five for the home gardener to both maintain a population size suitable for maintaining genetic diversity, and also maintain appropriate isolation distances from other bean crops. Using a square-foot gardening technique, a row of beans 15-20 feet long × 1 foot wide or a double row 10 feet long × 2 feet wide will yield enough to permit attrition due to deer, disease, and occasional errant basketballs, and still have a viable population. And unless you and your neighbor are both trying to grow beans in the only sunny part of land in your neighborhood, which just happens to fall directly on your property line, you’ll probably be able to keep your plants 20’ from another variety of bean plant. Urban patio gardeners: Beans may be grown in containers, using cage-type trellises to support the vines as they grow. Grow as many plants as your space permits, but do not overcrowd your containers. Plan on one plant per 8″ of container diameter. Spacing from other plants may be more challenging for you. Can you tell what your neighbors are growing? Enjoy some of your beans, and leave some on the vine until they turn leathery and yellow, tan, or brown in color. Then remove the pods from the vine, and dry them out of direct sunlight for a week. When the beans rattle in the pods, they are ready. Corn is tricky. Let’s come back to it in another post. Melons likewise are challenging. We’ll address those in a separate post. The trouble with tomatoes, from my perspective, is that there are only 200 interesting varieties. How can one possibly pick just one variety to grow in the home garden? I have no discipline: If I have the space to grow 10 to 20 plants such as would be recommended for a good seed-saving population, I will grow 10 to 20 different tomatoes. It helps that tomatoes are primarily self-pollinating. If it is possible in your garden to grow multiple varieties and observe the 40’ planting distance from other tomato varieties, by all means do so. But the popularity of home-grown tomatoes means you would do well to pay attention to what your neighbors are growing if your sunniest spot happens to be near your property line. Acknowledging these challenges for the sub/urban gardener, my best advice from a seed stewardship perspective is to grow as many plants as you can of the variety you love best, say, ‘Brandywine.’ Cluster them together, tend them well, and select appropriately. If you cannot resist growing 15 other varieties, consider growing those well apart from the best-loved variety. Knowing that the other 15 may mix between themselves, if you save seeds from those varieties, keep those seeds for yourself. Keep detailed notes on how those plants behave from year to year, select them as you will for the Brandywines, and if they appear to be quite stable, then you may share them. And if you live in an apartment and can only grow 1 tomato plant, grow it and enjoy it. 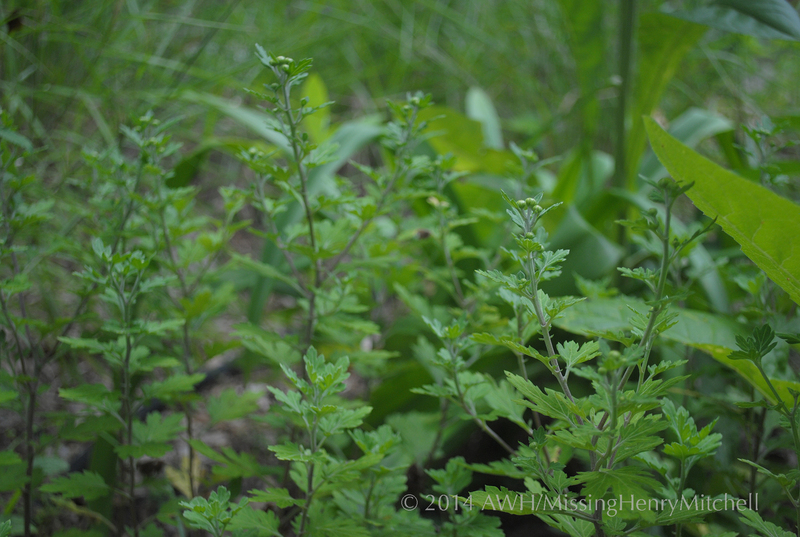 If the plant is healthy, save seed from it to use next year. It’s your treasure. Squeeze the pulp and seeds from several saved fruits into a glass jar, and top it off with tap water. Leave it on the kitchen counter for a few days, stirring occasionally. (It will begin to mold, so this may not be the time to have your mother-in-law over for dinner.) The white mold can be stirred back into the mixture with no ill effects. How to know when they’re finished fermenting? There are several indicators that may be used, but I have had fine luck simply waiting 48 hours. You may want to try the different methods described here and find the method that works best for you. Rinse the seeds several times using a metal mesh strainer. You may need to rub some residue off the seeds if they won’t come clean by a simple rinse. I find the spray attachment that comes on many kitchen faucets works well, as long as the spray doesn’t hit the seeds with full force. Spread the seeds on a cookie sheet and let them dry for a week (it may take up to three weeks for the seeds to fully dry), and store them in a labeled paper envelope placed in a glass jar in the refrigerator. You may put a packet of silica gel, such as you find tucked into a box of new shoes, in the bottom of the jar to absorb extra moisture, provided the packet is intact and the seeds are well secured in their envelopes. Good heavens. 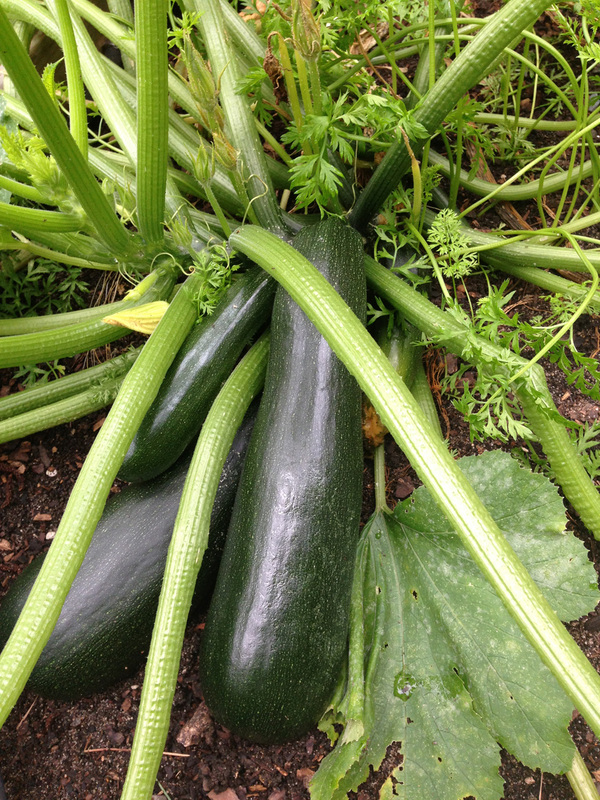 I can barely keep up with the produce from 1 zucchini plant, let alone the 10 recommended for selection purposes. I should like to see the freezer big enough to hold all the zucchini bread one could make from 20 zucchini plants. But perhaps your next door neighbor, or one across the street, or both, wants to grow zucchini as well. If you all are concerned about genetic diversity, you can all grow the same variety, splitting the seed packet between you. You might then be able to each select your best plants, save those seeds, and perhaps share a few seeds between each of you to spread the risk. What are their neighbors growing? If they’re growing a variety of yellow summer squash, you might have an isolation issue. Fortunately, squash are easy to hand-pollinate. You could take this route, and use floating row covers to isolate the plants from the neighbor’s yellow squash. Urban gardeners: I’m guessing that, due to the plant’s enormous size, heirloom zucchini may not be high on the list of plants to grow on a balcony. If you want fresh zucchini, you may need to go with an F1 variety developed to grow compactly. You can still have grow such plants organically, but heirlooms may simply not be practical for you. Squash and zucchini are cucurbits, which are notorious cross-pollinators. I’ll get to this in more detail when we explore growing melons. Allow some fruits from the best plants to grow very big and to harden. Harvest them, then allow them to cure at room temperature for four weeks. Remove the seeds, cleaning the pulp from them, and rinse them well. Spread the seeds on a cookie sheet and allow them to dry for several weeks. Store them in a labeled paper envelope in a glass jar in the refrigerator. In order to save seed and, more to the point, be a good steward of the health and success of open-pollinated varieties, it’s important to take a few precautions. Perhaps the most challenging one, particularly for (sub)urban gardeners, is that of observing some isolation distances. Isolating plants is a way of preventing the pollen of two closely related varieties from mixing, thus ensuring a relatively stable and pure strain of seed. A pure strain of seed? Didn’t we want genetic diversity? Well, yes, but not too much. There is a balance to be struck: We want enough diversity to maintain a healthy and well adapted variety, but not so much that the heirloom cabbage you love doesn’t resemble that same cabbage anymore. Seed saving and seed stewardship are a blend of art and science, but don’t be terrified or put off by that. You alone will not irrevocably destroy your favorite variety of cabbage. Of course, if your whole ambition is to produce a totally different variety by throwing everything into the pot and seeing what comes out, plant with abandon, but please don’t share your resulting seed and promise it’s going to be the original. And be considerate of your neighbors, and any plans they may have for their own gardens. Assess your site. Understand the space you have available to grow your crops and the light the site receives. Identify the crops you want to grow. Learn your plants’ scientific names, and which other plants share that scientific name. That means both parts of the name: the genus and the species (not the part in single quotation marks). It’s especially important if you wish to grow cucurbits (squash, cucumbers, melons, pumpkins) or brassicas (broccoli, cauliflower, cabbage, collards, kale, to name a few). What your neighbors’ plans are for their summer gardens, if any. Whether anyone in your vicinity is a beekeeper. The topic is a big one to grasp (bigger than I realized when I set out to research the issue), so I’ll break down an example in my next post.